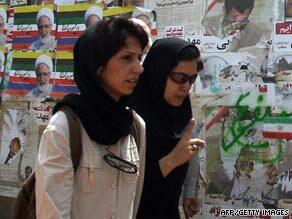 TEHRAN, Iran (CNN) -- The day before polls open in Iran's presidential election, the streets are suddenly quiet again as official campaigning comes to an end, and voters prepare for what is expected to be a record turnout. Posters for all four candidates are pasted on walls. Whereas President Mahmoud Ahmadinejad was a sure bet just 10 days ago, the race has closed this past week, in what is clearly turning into a referendum on his four years in office. Rivers of green have flowed through the streets, those decked out in the colors of his main challenger, former Prime Minster Mir Hossein Moussavi. The week started with tens of thousands of his supporters forming a human chain along 17 kilometers of the main Tehran artery Vali-Asr Street. Called out by text message and email the numbers exceeded all expectations, their ranks swelled by thousands more who joined the chain spontaneously or just lined the route to watch. They accuse the president of lying about the shape of the economy, overseeing higher prices, higher unemployment and higher inflation over the last four years. By the end of the week Moussavi's supporters stretched as far as the eye could see from one end of Tehran to another, in scenes not witnessed here since the Islamic Revolution swept this country back in 1979. Wednesday night a deputy leader of Iran's Revolutionary Guard posted a warning on their Web site, vowing to "crush" any attempts at a "velvet revolution" in Iran. Commentary: Iranians favor peace deal with U.S.
President Ahmadinejad also drew large crowds, but even his most fervent supporters conceded, they didn't come close to Moussavi's. His staunchest supporters are among the traditional, the poor and the religious faithful. One woman wrapped in a black chador and tight headgear said: "He's the best president we have had in all the past 30 years in every way." Another woman says: "He is truly our courageous champion and he'll definitely win, we believe in him." Ahmadinejad has courted this base by constantly traveling around the country handing out cash, and favors in the rural provinces. But he has not been able to keep the election promise he made four years ago -- to "put the nation's oil wealth on everyone's dining table." Azam, who works as a domestic help, says she can barely make ends meet even though she works 16 hours a day. She can't afford the soaring price of meat or vegetables. And most of her salary goes to paying her rising rent. Leading Iranian economic and political analyst Saeed Leylaz says the president's huge handouts and his monetary policies have driven the country to the brink of disaster. Ahmadinejad has managed the economy "in a catastrophic disaster way in my opinion" says Leylaz. "Under President Khatami (four years ago) we earned $100 billion with average 5.6% economic growth. We tripled oil revenues but the economic growth stayed about the same," he said. " What does this mean?" asks Leylaz. " It means this machine is corrupted, it does not work anymore and you have to change it." With the stakes so high at home and on the world stage, many are calling this a turning point election for Iran.